Locksmith Houston is one of the best locksmith companies in Houston providing Car locksmith Houston Service. There is no vehicle whose lock and keys we cannot handle. We can cut and program keys for all types of vehicles available on the road. Our expert locksmiths for automobile locksmith services have been trained a lot in the field of auto locksmith services and they are fully licensed and insured guys. Whatever emergency situation you have pertaining to the auto locks and keys, just give us a call and we will be there with you in just 20 minutes! BH locksmith can handle a huge variety of automotive ignition keys. We provide replacement, duplication of your vehicle keys and all sorts of auto locksmith services. Our service people are auto locksmith houstonspecially trained and have years of experience in cutting and programming keys of your vehicles. We are mobile units and we reach directly to your place with all the equipments needed in very less time. Therefore once you call us, you don’t need to worry and we will take care of the rest. We understand the security of your cars and other vehicles and therefore try to give you the maximum quality from our Auto Locksmith Houston. Are you stuck out of your car due to lost car keys and not able to get back into it? Well, this is a crucial situation and anybody can panic. We understand this and therefore we have 24/7 emergency auto locksmith services Houston ready for you. We understand how important for you to get back into your car and come on road. 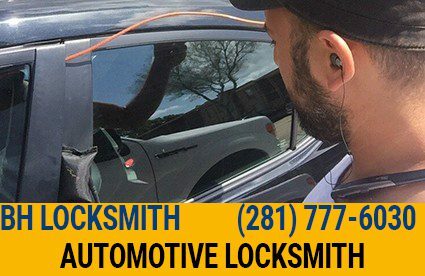 So whenever you need emergency auto locksmith services in Houston TX, call us and we will reach you within 20 minutes of your call. Rest, leave everything on our shoulder and you will be able to drive again within the minimum time possible. Professional Locksmiths – When we respond to your calls, you can expect to get quick and honest answers. This also works the same way for our emails. When we do house calls, we make sure that all our locksmiths will be easily recognizable with their uniform on. If you ask, we can even give you our business cards, or just save our number. Wide range of services – Our company provides residential to commercial and automotive locksmith services. We can help you when you need roadside assistance after being locked out of your car on your way to watching a Dallas High School soccer game, when you broke the key to your home, or when you misplaced your key to your store. Using a dedicated vehicle locksmith is essential if you want quick and successful car key cutting. The locks on cars and other vehicles are typically more convoluted than most others because cars are more exposed to the public than many other items. As such, the keys that open these locks need to be made quite carefully. An automotive locksmith will have the necessary experience to produce replacement car keys much faster than a locksmith who does not regularly assist with such matters. Find a trustworthy and dedicated vehicle locksmith though, and you may be back on the road within an hour. automotive security needs? Give us a call us right now.